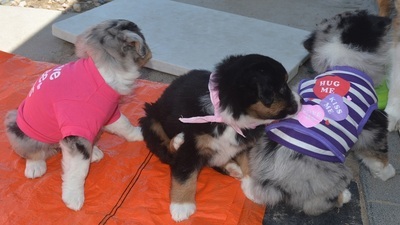 74 Ranch is the first/only breeder of Mini Aussies and Wyoming breeder listed on the Puppy Culture Breeder's map, meaning we raise our puppies using all the techniques Puppy Culture offers. We firmly believe in this program. 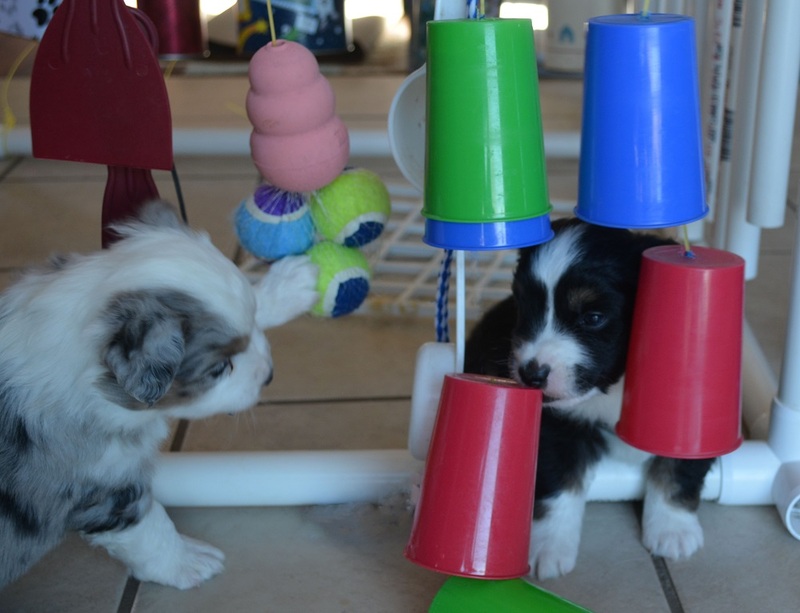 Puppy Culture is a birth to 12 week program implementing the science of behavior and puppy development designed to help develop pups to their full potential. It prepares our puppies for life through a series of exercises to be more adaptable, confident and more able to fit in our society. It also helps puppy owners be more effective in their training and understanding their puppies. Since our implementation of Puppy Culture our litters are even more ready to handle life's challenges. They are more resilient, stable, responsive, smarter (if that's a possibility) and their recovery time is even faster. We help shape our puppies futures to be the best that they can be so that they can be the dog that everyone would want to own with less or no puppies ending up in rescues! We highly recommend you continue on with the program from 8 to 12 (or longer) weeks old. The first 12 weeks of your puppy's life is the MOST IMPORTANT time to shape the way that puppy will live and cope with its life. 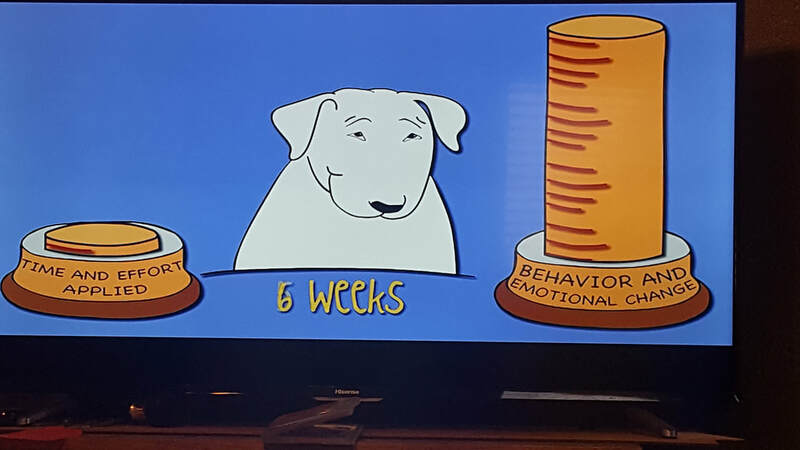 Puppy Culture is available in DVD, BLU-RAY, and Video on Demand with over 50 lessons arranged in a logical, week-by-week timeline to provide breeders and puppy owners a clear roadmap for raising a puppy. Much of what people feel is a problem adult - from aggression to lack of focus - often comes due to a failure or omission in the first 12 weeks of life! 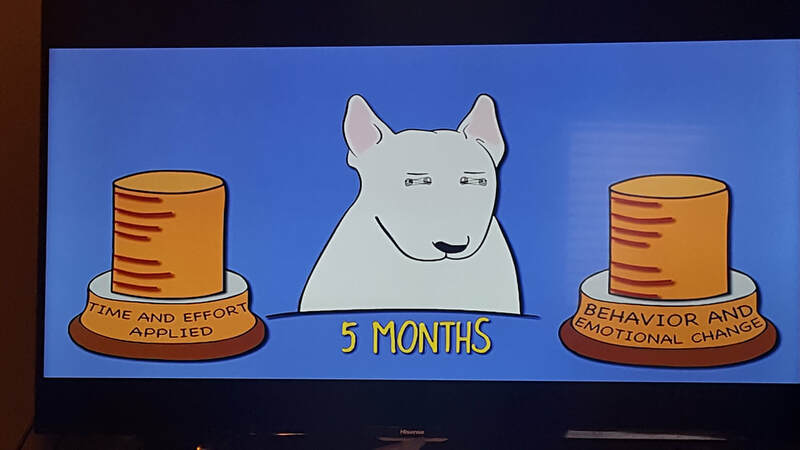 Since we have the pups the first 8 weeks of their life we feel it's highly important to do our part in producing a well-developed, well-balanced adult dog. You can still get good results on an older puppy/dog but it will take a lot more time and effort. 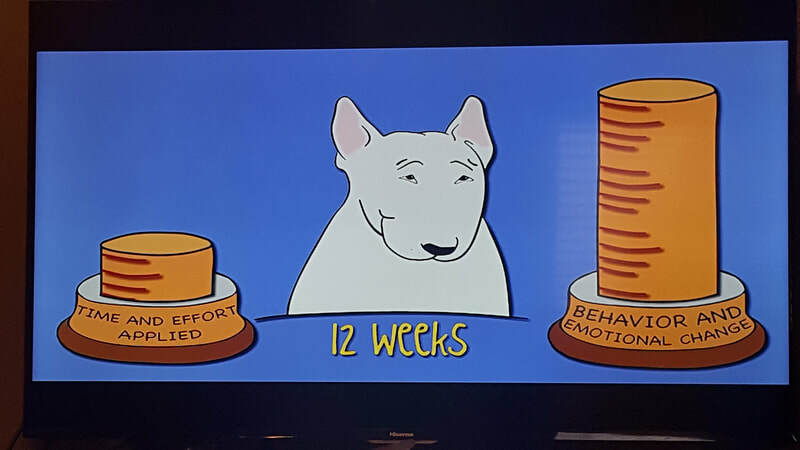 The first 12 weeks the puppy's brain is a sponge. Once that window closes you have to train behaviors or desensitize. Pregnant female's belly is stroked and she gets a lot of attention. 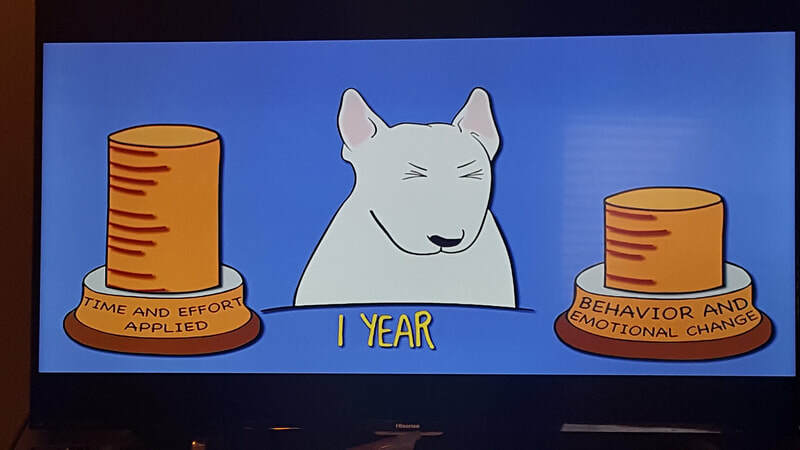 The emotional health of mom reflects on the puppies. 2-3 weeks: Eyes and ears are now open so socialization begins. We also start potty training and have their bed be in a crate with the door open so they get used to going in and out of that and it makes crate training easier at 6 weeks. 3 weeks: They ask for attention. They sound violent but it's normal for them to growl. We keep the nails short and introduce a new toy each day. 3 1/2 weeks: We start having visitors. We start teaching recovery from fear - bouncing back. We make loud noises, slam doors, vacuum, use blender, drop pans, play noise CD's, etc. They recover almost immediately and don't really have fear. They need to recover from startling from people. We take each pup out individually each day. We start feeding food at this time and teach them to 'come' when putting the food down. We feed in a frisbee, stainless steel, plastic, a round sled so it wobble some, etc. so they get used to eating on different surfaces. We touch and handle their ears, paws and mouths. 4 weeks old: We start giving them lots of space to play and exercise throughout the day. We introducing challenging things and change objects daily. We start introducing cats, other dogs, etc. They are asked to do some problem solving (and dealing with frustration), we do not help them they have to figure it out on their own. We start clicker/treat training using Cheez Whiz. We want them to 'ask' for things not just expect it so they must sit when they want something from us - in front of us with no verbal cue. When they do they get a treat. We introduce an adventure box from Avid Dogs with different textures, colors, items for more stable puppies. If the crazy Wyoming weather happens to be nice we introduce them to the outdoor world. We add using 'come' as they come towards and back in to the house. The puppies go for their first car ride this week. They have grates to walk over, cat toys to play with, wobbly items, things to step and climb over, different textures to walk over - rock, wood, tile, carpet, cement, dirt, grass, etc. from now until they leave for new homes. We start our manding training at this age too. They have to sit to be picked up, get fed, get a treat. etc. We continue this until the puppy leaves our home. 5 weeks: A Fear/sensitive period can set in during this time We expose them to new things but if they are overly afraid we proceed with caution. We want their experiences to safe. We have lots of lovey time and continue clicker training. The puppies go for another car ride or two this week. We spend even more time with them away from their mom and siblings. Short periods of training are necessary though, they get tired quickly. 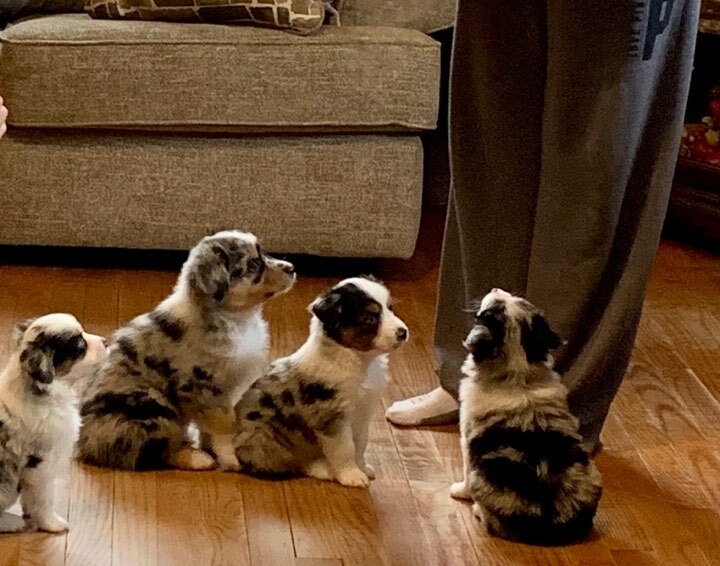 6 weeks: They have high curiosity this week. We try to introduce the ducks in the later part of this week. We have visitors come play and work with the puppies setting down the rules beforehand. 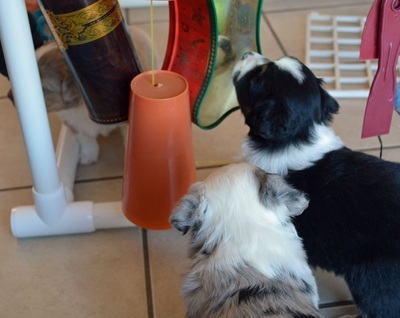 We introduce the puppy walk and wobble board. We take them to the neighbors for new experiences. We put clothes and scarves on them ;)! 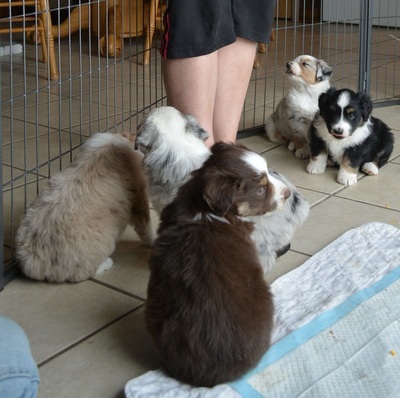 We start group then individual crate training in different crates. 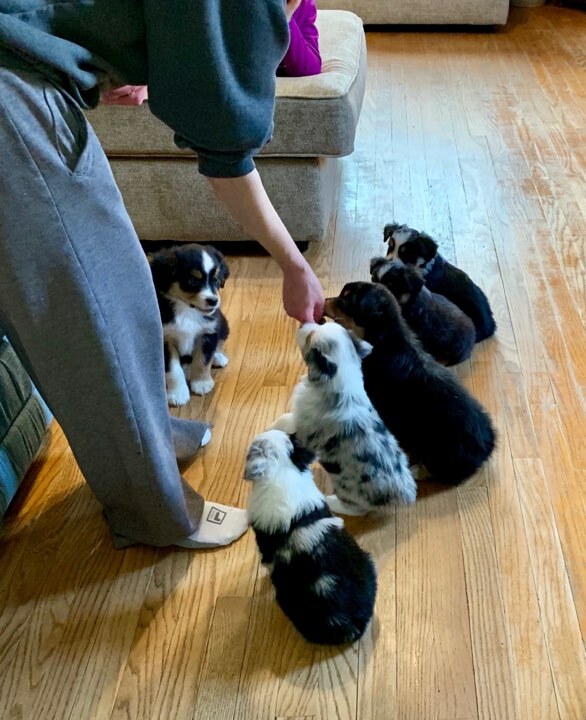 7-8 weeks: We continue what we have been working on with them as well as work on resource guarding, following our hands/fingers with food in them, give them food puzzles, start on scent training, having a collar on and leash training. Many litters are introduced to the ducks on the ranch and all of them are introduced to the cats. We start our matching to new prospective families at 7 1/2 to 8 weeks old. Puppies are vaccinated, get microchips and are ready to go! After they go to new homes: The new home reinforces what we have done and continues on. The first 4 months are the most important in your puppy's life so be sure to do the most the first 2 months you have them! WE HIGHLY RECOMMEND ALL OUR PUPPY CLIENTS TO PURCHASE THESE VIDEOS IN ADVANCE OF GETTING YOUR PUPPY!!! WE REQUIRE ALL FEMALE GUARDIAN HOMES TO IMPLEMENT THIS PROGRAM!!! 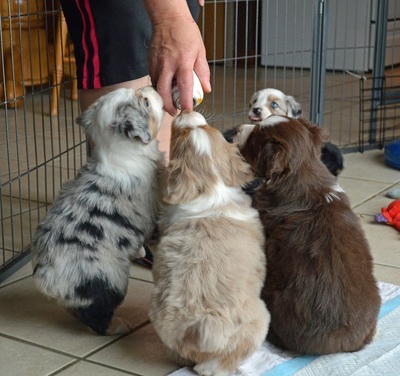 with smaller breeders who will have and take the time to do Puppy Culture! The illustration below shows the difference is starting young. We start them at 3 weeks old here, you continue for your first few months they live with you and it will change their whole life as well as yours!!! Be sure to buy your own copy of Puppy Culture and you will be amazed!! !